Dialogue is difficult and is even more difficult when the parties involved do not share many common core beliefs. This is particularly true when looking at dialogue between people of different faiths or religions. This book looks at this challenge from a number of different angles. The core perspective is that interreligious dialogue must start from a position of respect and mutuality, with the primary goal of clarifying similarities and differences. While this may seem obvious to many (though certainly not to all), doing this is harder than it may first appear. This book was written for Christians, and perhaps specifically those of the Evangelical tradition, to help them gain an understanding of some of the challenges, along with some guidelines in how to be more effective in dialogue. That being said, people of a wide variety of perspectives may find the general principles quite applicable to their situation to become better at interreligious dialogue. by Robert H. Munson. 2017. 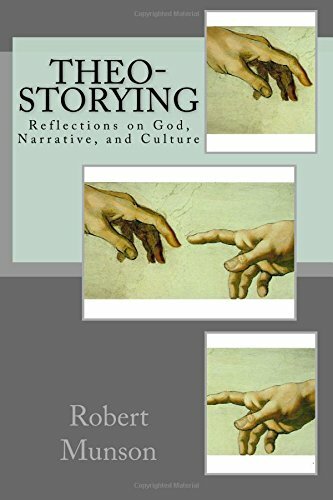 Theo-storying:Reflections on God, Narrative, and Culture. by Robert H. Munson. 2012. We as humans appear to be hardwired for stories. Whether the stories are in terms of myths or parables, whether they work in terms of metaphor or image, in the end we understand the abstract through narrative. God and our relationship with God, are concepts that stretch our ability to fathom cognitively. On an affective level, we are lost, commonly describing God, for example, in terms of who or what He is not, rather than who He is. The Bible exists culturally and historically bound in story. Jesus taught with stories, as well as many others in the Bible. Even when stories were not used directly, imagery and metaphor were commonly used to draw the ineffable into our own world of familiarity. This book will not seek to tackle the great challenges of Narrative Theology. Rather it seeks a humbler goal– to encourage people to think and speak of God in terms of stories that resonate with culture. “Godtalk” should be more about parable than proposition, story than statement, and inspiration than information. The latest Revision (#3 I think). Paper or Kindle copies may be Purchased HERE. 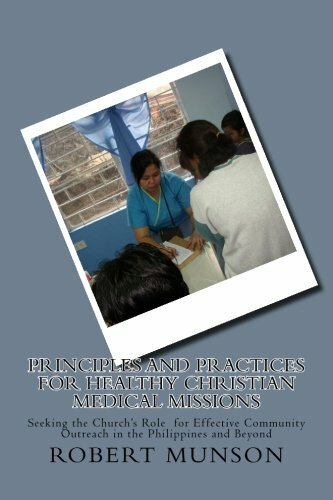 Principles and Practices for Healthy Christian Medical Missions: Seeking the Church’s Role for Effective Community Outreach in the Philippines and Beyond. Based on my dissertation. Looks at guiding principles for how short-term medical mission events can be done in partnership with local churches for long-term community impact and transformation. Click HERE. by Robert H. Munson and Celia P. Munson. 2016. Finally finished it after 3 or 4 years (working on it a bit at a time, off and on. It is written for Bible school students, especially for Intro to Pastoral Care & Counseling Class or Clinical Pastoral Orientation. Vol. 2, The Dynamics of Pastoral Care, for those dong Clinical Pastoral Education (CPE) or Clinical Pastoral Supervision, is still only about 40% done. It will take awhile. The primary focus is the Philippine context, but not exclusively so. Dynamics in Pastoral Care. 75% done. Hopefully will be done in early 2019. A follow-on to “The Art of Pastoral Care.” The focus is on the dynamic qualities of therapeutic relationships— particularly in terms of group dynamics, family systems, and the supervisory relationship. Thoughts on Wholistic Ministry in Biblical Context. by Robert H. Munson. It has chapters on different passages of the Bible, reflecting on them through the lens of wholistic ministry. You are certainly welcome to look at it. by Robert H. Munson. Insights I had on missions based on my first 4 years serving in missions at seminary in the Philippines and leading a medical mission organization (with family). Looks at a number of aspects of how missions and theology intersect… or should intersect. Includes topics in the theological foundation for missions, reflective theology, contextual theology, and evaluation of contextual theology. I have around 70 pages done, but will probably never publish it as a book. One chapter has become chapter 17 of my book, “Ministry in Diversity.” Other parts are being used for various training materials and articles. May utilize it eventually to provide material for a book on Inter-religious Dialogue, or something similar. We will see.